HomeWhy do we all need to control tsetse together? 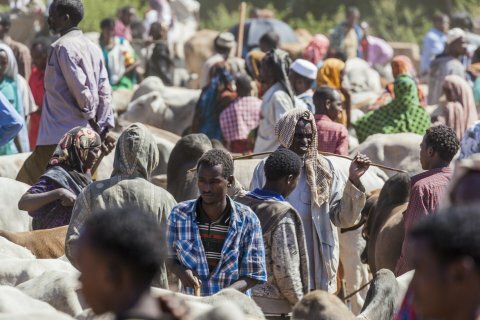 The control of tsetse by insecticide-treated cattle depends on all, or at least the great majority of, livestock-owners in an area treating their cattle, so that around half the total herd, evenly spread across the area, is treated. This is because insecticide-treatment does not give any protection to an individual animal. Insecticides are not repellents and do not prevent flies landing on cattle. The insecticide on a cow's skin may take several hours to kill a tsetse fly, by which time the fly may have infected that cow and others of the same herd with trypanosomiasis. The effects of insecticide treatment will only be felt when the great majority of cattle-owners in a sufficiently large area collaborate in following a proper treatment regime. If targets are used, alone or together with insecticide-treated cattle, they will be protecting the cattle of many cattle-owners. The targets should therefore be looked after (guarded against accidental damage or theft, and kept replenished with insecticides and attractants) by the cattle-owners collectively, though they may choose to delegate this responsibility to individuals, against payment in cash or kind or any other arrangement they choose.